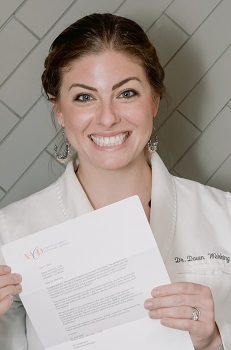 Dr. Wehking Passes AACD Accreditation Exam! In May, I sat for the American Academy of Cosmetic Dentistry Accreditation Exam (say that five times fast) in Orlando. I’ve been waiting three months to learn the results and I’m happy to share that I passed! The AACD accreditation process is the world’s most recognized advanced credentialing program encouraging further education, interaction with like-minded colleagues, and the opportunity for professional growth. This is just the beginning of an exciting journey! Now that I’ve passed the written exam, I have five years to document and submit five gorgeous cosmetic cases based on a series of requirements. When I have successfully passed those five cases, I will be awarded Accreditation of the AACD. Why does this matter to me? Most of you know that I’m very passionate about occlusion- making your teeth fit together in a position that is cozy for your jaw joints and muscles. People who have battled with occlusion problems deal with more than just headaches and facial pain. They also typically have cracked and worn teeth. More often than not, restoring someone’s occlusion requires changing something about the front teeth. And why wouldn’t we want those front teeth to look natural and absolutely SPECTACULAR?! The team and I at Complete Family and Aesthetic Dentistry are excited about this journey towards accreditation and can’t wait to show you what’s possible! Give us a call if you’re thinking about making any improvements to your smile. © Complete Family & Aesthetic Dentistry of Lafayette, CO.